GM Khenkin, Igor took clear first with 6.5/7. WGM Gara,A finished with 5.5/7 for a good result. IM Sipos was clear first with 7.5/9. 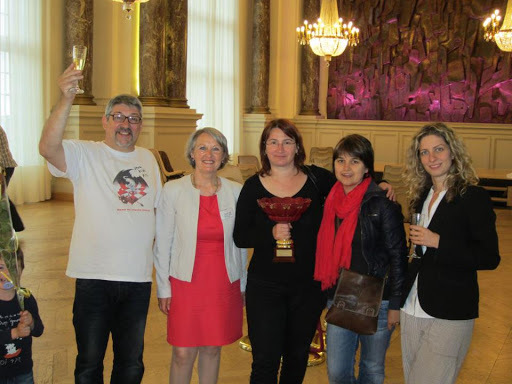 A large group of Hungarian players participated including IM Gara,Anita. Here is a nice attacking game by IM Gara,Anita(HUN) with annotations(Hungarian language) by the winner. The dark squares around black’s king are vulnerable. What do you recommend for white? Play a game(or more) one-on-one with IM Anita Gara or WGM Ticia Gara. Details here. Gara plays for a quick kingside assault with a fast g4 and grabs a ton of kingside space for a squeeze. Eventually white infiltrates on the h-file and decides with the kingside passed pawns. White is making progress on both wings. What do you suggest for white now? Most of the results have already been reported. 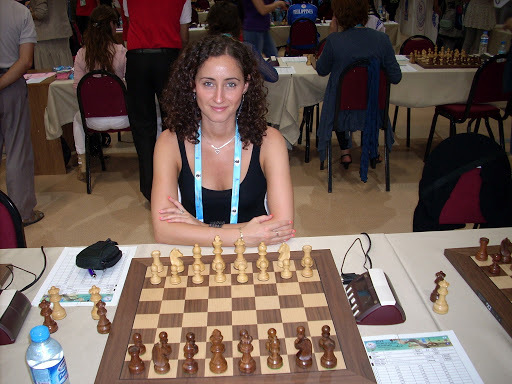 The French Women’s TCh had the most recent action with Anita Gara, Anna Rudolf and Ildiko Madl playing. ‘The French top 12 females team competition finals are taking place 15th-17th February in France. The participating finalists are Annemasse, Bischwiller, Bois-Colombes, Evry, Juvisy-sur-Orge, L’Isle-sur-la-Sorgue, Metz, Montpellier, Mulhouse, Naujac, Toulouse, and Vandoeuvre. Top seeded team is Evry Grand Roque with Anna Muzychuk, Marie Sebag, Sophie Millet, and Sabrina Vega Gutierrez on the top boards. The fourth strongest competitor is Philidor Mulhouse Elisabeth Paehtz and Lubka Genova leading the team. FSGM February 2013-Nguyen Huynh Minh Huy won with 6.5/9. FSIM February 2013-Lyell,M won with 7/9. FSFMA February 2013-Borda,L won with 7.5/9. FSFMB February 2013-Marcu,Simon won with 9.5/10.